No other obsession strikes as hard as the love that hits a teenaged boy — especially if he’s the sort of kid who is no saner than he wants to be. From the moment Adam Webb sees Francine Haggard—in the van that is supposed to return them to the Institute Loiseaux—the two young mental patients are inextricably connected. Adam will never let this girl go. 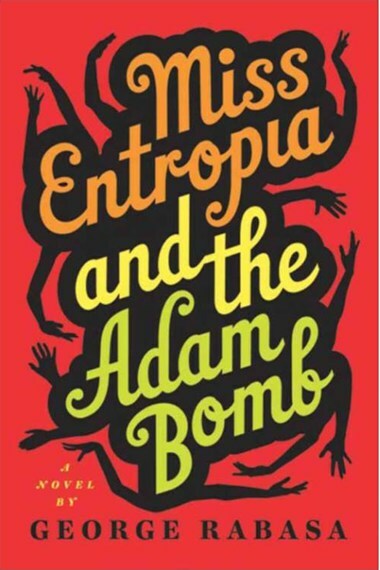 From hiding her in his bedroom to spiriting her away to Minnesota’s north woods, “Miss Entropia” becomes the focus of Adam’s every thought and of everything he does. He believes her to be a goddess, his own goddess. But the pyromaniacal Miss Entropia will be neither worshiped nor owned. And so Adam’s possessiveness is destined to push her to the breaking point. Theirs is an incendiary love story, an unbalanced Romeo and Juliet, that spins and arcs its way strangely toward tragedy. I didn’t know it at the time, but I was about to make the leap from quirky childhood to fully unleashed adolescence. Out on our porch stoop, waiting for the van, I’d felt the breeze of liberation for the first time in the two months I’d been home. They were coming to take me away, and I was exceedingly glad. Yes, goodbye, Mom, good-bye, Dad, good-bye, Iris, good-bye, Ted, I’m off to Institute Loiseaux. Better known as a home for the cleverly complicated. It’s not a place for everybody. The entrance requirements are rigorous. It takes more than being challenged in the conventional ways, reality-warped, emotionally stunted, mentally fevered, attention-deficient. You gotta be cute to get into Loiseaux. No bobbing heads here, no fatties, droolers, spitters, or snifflers. No predators, delinquents, bullies, tweakers, juicers, or tokers allowed, no matter how delightfully odd. It does help if you’re an affluent exotic, a mass of psychic knots, a tangle of phobias and compulsions backed by a trust fund. Then even the suicidal and the homicidal are welcome. Hippies and goons, poets and anorexics, twitchers, Touretters, and the vaguely traumatized are all hugged close to Dr. Clara Loiseaux’s pillowy bosom, feeling the warm embrace of the maternal healer, inhaling her distinctive scent of rose petals and licorice. I rolled down the window, and the whir of tires on the pavement brought back the sound of my trike when I was six, yes, a three-wheeler because I was not blessed with even a minimal sense of balance. After trying training wheels on a regular bike, all geared up with knee and elbow pads and a helmet to protect me in my frequent tumbles, I was given an overgrown child’s contraption with balloon tires and heavy-duty hand brakes. No matter. Rocinante, as Mother named my conveyance, flew like the wind, responding to my frantic pedaling on the uphills, then back, feet out, legs splayed like wings, caroming on the downgrades. Swaddled in heavy corduroy pants and a sweatshirt, I could feel the wind blowing on my face and hear the hum of rubber on asphalt singing in my head. In the years since, I’ve never been able to recapture that sweet momentum, the sensation of rushing so fast that a slight bump on the road would lift me and Rocinante off the ground into a frictionless surface of pure air.